The year just finishing has been a bit of a busy one, woolly-wise, and it's been rather hard to keep on top of, now that I have a full-time job rather than the part-time one I had for such a long time. But heigh-ho, can't complain when so many people haven't got one at all. 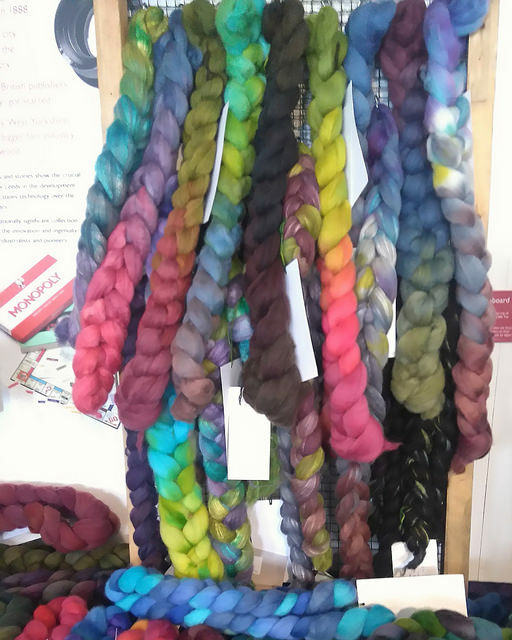 February was the Spinzilla Team's day out at Curtis Wools/Haworth Mill in Bradford, at the kind invitation of Martin Curtis who sponsored the team, to see their enormous scouring and combing set up. Eye-opening to say the least. They process nearly all of the British wool clip, which is a small portion of their total through-put - there are wools from all over the world (the stuff from Saudi had a little pile of sand underneath it). Not to mention Jamieson & Smith's lovely, lovely Shetland. 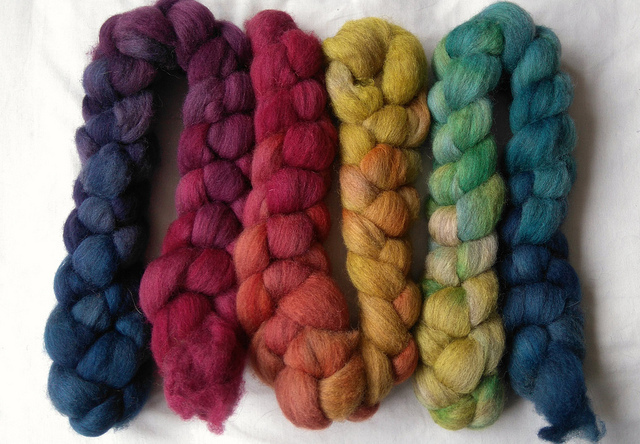 In March I spent a weekend with Lancs & Lakes Guild, giving a talk on the first day ('Stuff Wot I Have Made') and a dyeing workshop over two. And then Mark and I treated ourselves to a long weekend in Edinburgh, to visit the Edinburgh Yarn Festival, and catch the Celtic Exhibition at the NMS (we'd missed in it London in 2014) which included the astounding Gundestrup Cauldron. And we visited The Kelpies on the way home. April was another busy one. I taught at Hallamshire Guild - my longdraw workshop, which is my oldest one but also my most popular. I love teaching this one! And then of course there was Wonderwool - we go down to Wales for over a week, taking a lovely dog-friendly cottage - with the show in the middle. 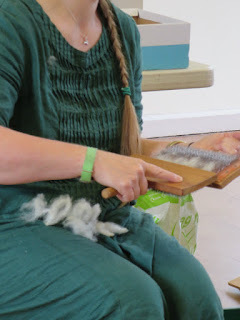 And once again I was teaching there, an hour's workshop on hand-carding on both days. This was the month we exchanged our small white van for the Big Blue Beast! During May we had two shows, the little one-day Wharfe Wool early on, and Tynedale Guild's Spinners' Open Day later on, both opportunities to catch up with friends as well as sell woolly stuff! And then teaching at North Cheshire Guild at the end of the month - long draw again. July is Fibre East month, which always takes a bit of organising because it's a camping one. We have to fit all the stall stuff plus tent etc in the BBB, but we managed. 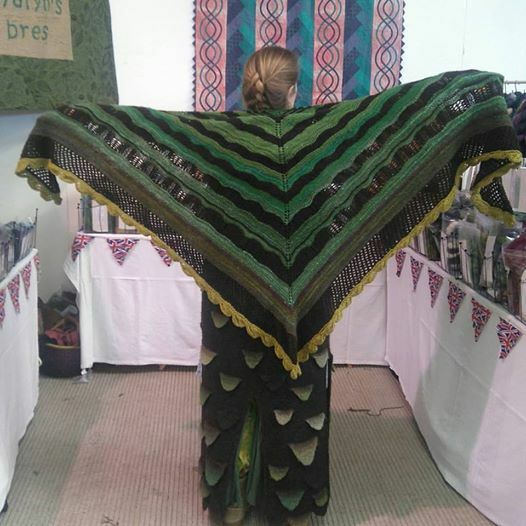 August was just one workshop, but it was in Peterborough, so we re-traced nearly the entire route to Fibre East onlly a week after the show. But that was a a really nice group of people (and Mark took the pups to a nearby park for walks and train-rides!) and we did my Woollen/Worsted workshop, exploring the differences between the two techniques. Bowland Guild in September was the first tryout for a new workshop - Combs, Cards, Drums and Hackles. That seemed to go well, and it's one where we know everyone well. 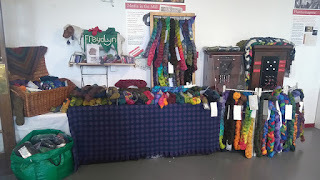 We had a holiday in Somerset in the middle of the month, the day after we returned I demonstrated spinning at a flooring show in Harrogate at the behest of Martin Curtis (to show what a wonderful thing wool is! 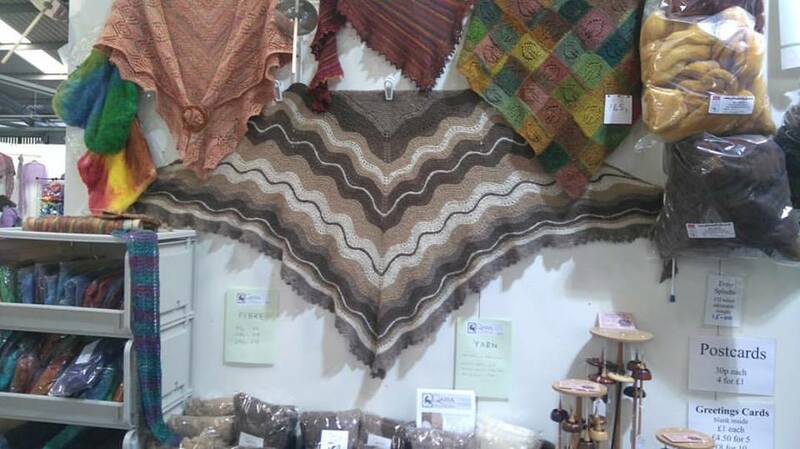 ), and then of course there's Yarndale at the end of the month. It always strikes me as terribly decadent, doing a wool show from home with our own bed at night! October is the really tiring one. 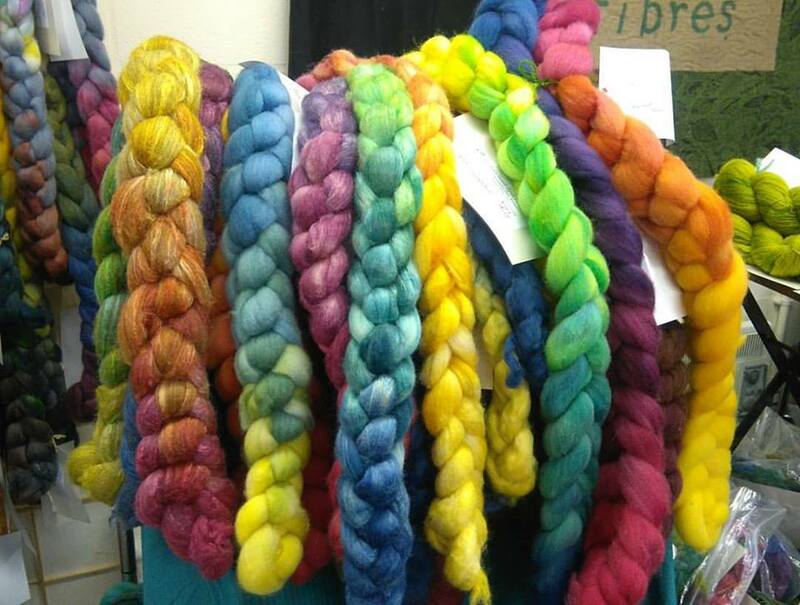 Spinzilla Week at the beginning (and our Hand Spinners Newsletter team was joined by another UK team this year). Then it's Bakewell Wool Gathering immediately followed by Kendal Wool Gathering. Phew! Once again, I failed miserably to get fibre and yarn photographed and online at the end of the year. This is the main casualty of the full-time job, just not having the energy or the daylight after October. Everything I knit tends to end up on Ravelry. All well and good - it's an absolutely vital tool for noting down yarn, needles, how a particular yarn behaves while knitted, what I've made and when. But it's also handy to keep notes outside of Ravelry too. And sometimes I just forget to take photographs. So this morning, it's been heavily frosty and cold outside, and I couldn't go to the gym as I was waiting a delivery (yak down and black shetland/silk since you ask), so I got organised and took photographs of the last few things I've knitted. This is the Icon Dress I knitted during this summer's Olympics. I'd originally bought the kit at the K&S show in 2012, then it kept slipping down the priority list. I wasn't happy with the way the pattern was written anyway - there are very few reasons not to knit in the round, and this wasn't one of them. So I cast this on as one piece (lots of stitches), and reversed the ss/reverse ss on the skirt to emphasise the pleats. And also de-emphasise the braids, which are now against a flat ss background. 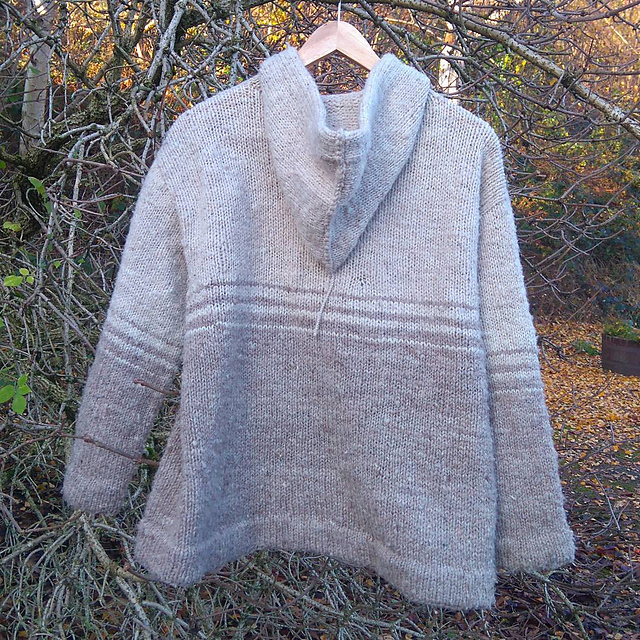 I also changed the neck to a plain round finished with applied i-cord, which I much preferred from the square neck with ribbing and a false button placket, which is too susceptible to stretching out. I made deeper armholes too, as I'll be wearing this over t-shirts. 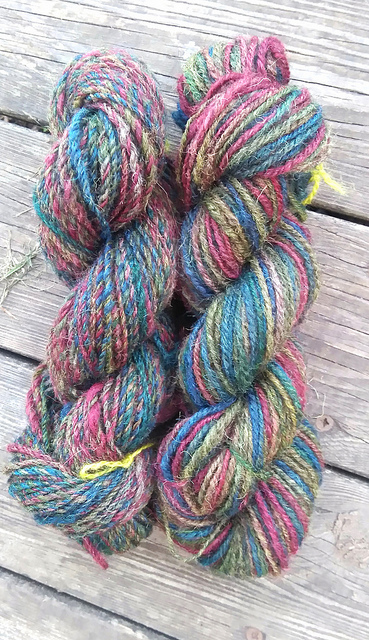 This yarn was spun up for Spinzilla 2015, from some CVM fleece I had squirrelled away. It wasn't a nice fleece, a bit short, so this was drumcarded and spun long draw into a 3ply yarn. It will pill, and is already. I cast on the night before we left to go to Somerset on holiday, knitted furiously for all car travelling, on Porlock beach, most evenings, and finished it in less than two weeks (over the week itself it was mostly finishing). There are no seams here, just three needle cast-offs. The only stitching is the edge of the narrow hood facing. 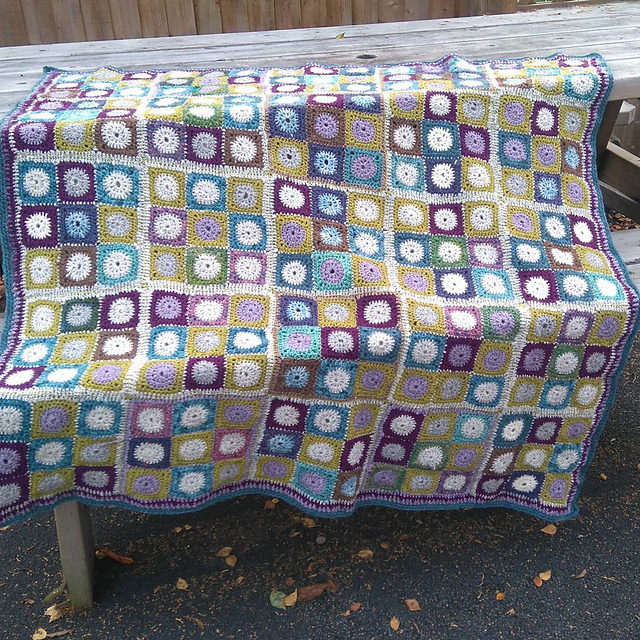 It's very warm and cosy if a tad short, but there's no more yarn. It's a very basic cardigan, no fastening at the front unless I use a pin, but the collar is lovely. Very nice construction, again no seaming, just picking up. 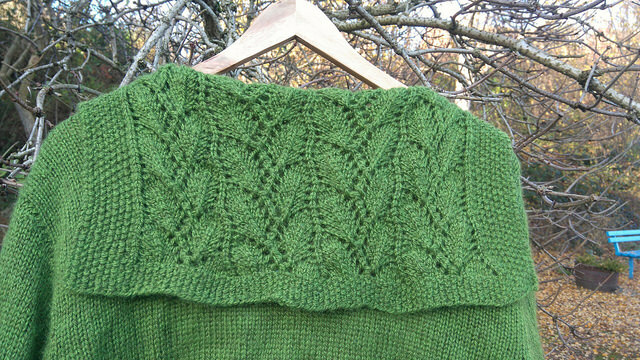 The original inspiration for the pattern (not mine) was gansey knitting, but the green is so lovely and leafy that I couldn't resist finding a leaf pattern for this sailor-collar shape. 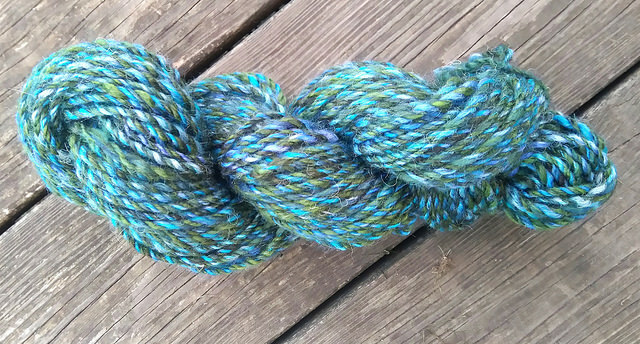 It's been getting quite a bit of wear, and the Dovestone yarn, though it pills a little, picks off nice and will wear well. This one's been on-going for much of the summer. 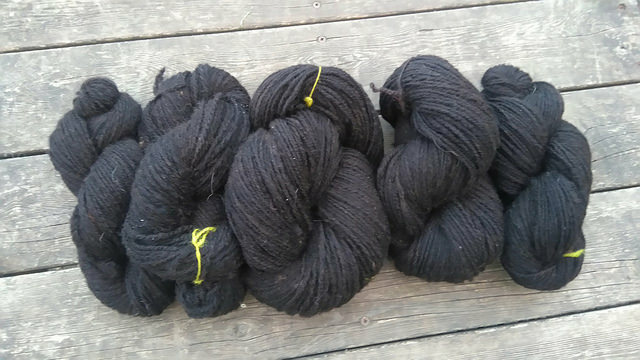 I have a terrible habit of diving into Blacker Yarns' sale bins at the wool shows, and had found myself with an embarrassingly large amount of their 4ply yarns, mostly in olive green and grey. So most of the little circles-in-squares here are grey centres and green outsides. 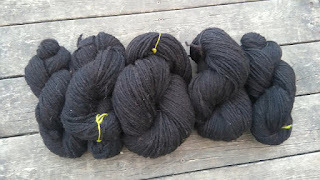 There is a bit of my dyeing too (over Blacker white), two shades of purple, and the occasional bit of handspun too. It's been being assembled over the last few weeks, and was finally edged off last weekend. 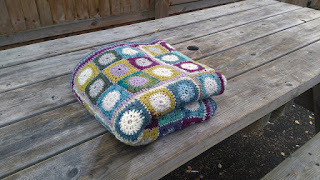 It has used up all the yarn I wanted it too, and I have discovered the addictiveness of crochet blankets. There will be more. Very satisfying to do. Though of course it does help that there is a sort of a colour-scheme, rather than just random leftovers. 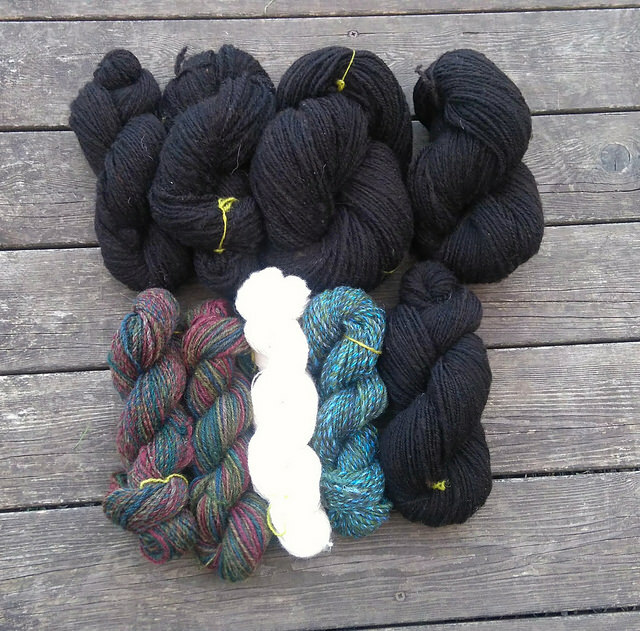 And these are the current knitting. Both have already been knitted nearly to finish, then pulled back and re-started. 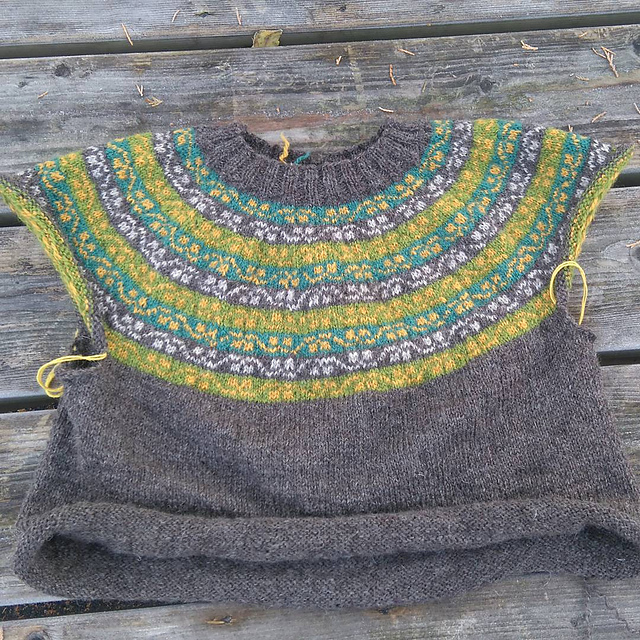 The Miss Rachel sweater at the top was originally for me, but I wasn't really happy with the shaping and was about to run out of the grey Buachaille. Mum liked it, so I pulled it back completely, and have re-knit from the top down, in a smaller size, with no shaping. 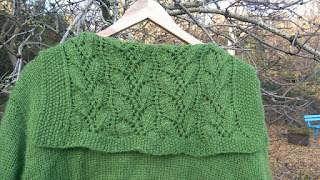 It's now simple knitting, just round and round, until I've finished the body and pick up the sleeves. 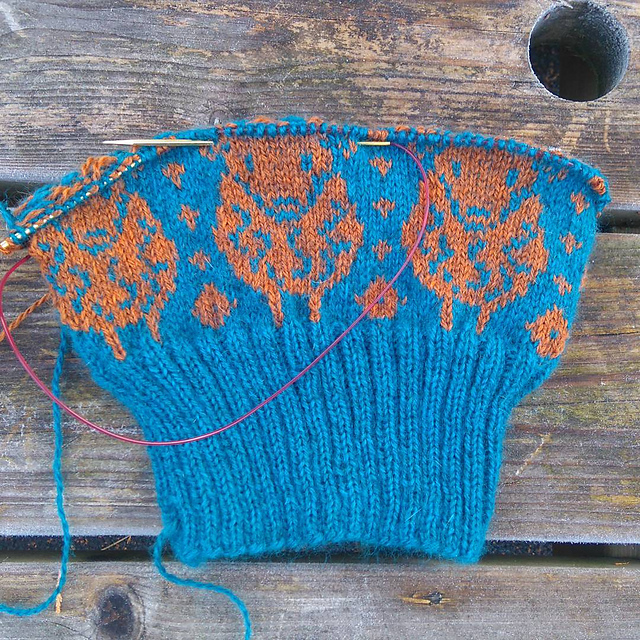 The Shornies hat below, from Ann Kingstone's Tups collection, has again nearly been finished, but the tension lied! I used the suggested needles (3.75) with Dovestone and it came out enormous even though my tension was apparently correct. So I've dropped to 3.25 for a much denser fabric, done one less sheep around than before,and it's coming out well. Though I feel the urge to cast on even more stuff. 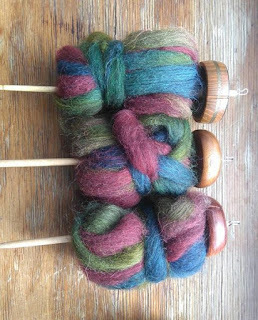 And I need to do some spinning soon. But we've been without hot water for nearly three weeks now (repaired once, but our boiler is ancient and needs a new (old style) themostat, which will happen eventually. And I'm not boiling kettles to wash fleeces (though I have three new ones in that need doing soon). And three kilos of yak down arrived today. Online sales updated at last! 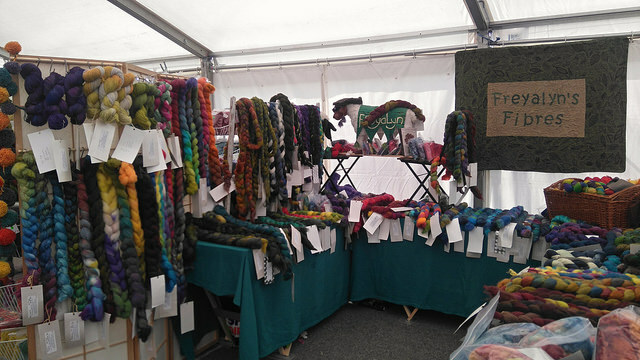 So here we are: finally, I've managed to find time and energy (in daylight) to start getting this year's fibres and yarns photographed and listed in my shop. So far, I've got all the Full Circle sets on, plus some of the other gradients. No yarn as yet, and lots more fibre to go. This was our stall at Bakewell. It was rather nice to have a wall behind us, and I complete rejigged the stall at the last minute as I thought I'd booked tables. In error, as it turned out. We were able to borrow one from Denise, and it turned out that one was all I needed. Look at the extra height I managed to get Gladys the Sheep up to! Once again, the Full Circle sets were popular. And I'd dyed up a couple of orders for people to collect from me here. We always go down to Bakewell a day or two early and stay in a cottage just above the town. 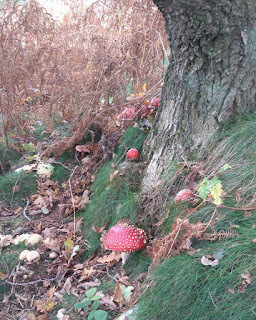 It was very strange only having one dog, but we still had a lovely walk on Stanton Moor, and went to say hello to the Nine Ladies dancing up there in the ancient oak woods. 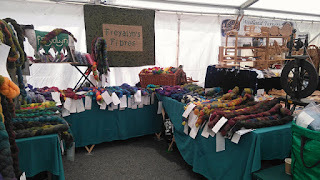 The following weekend was Kendal Wool Gathering - and this is where I start to get exhausted, not having any time off. We set off just after 6am on Saturday morning to set up in plenty of time before opening, and were very pleased with out spot, just before a nice big window for natural light. 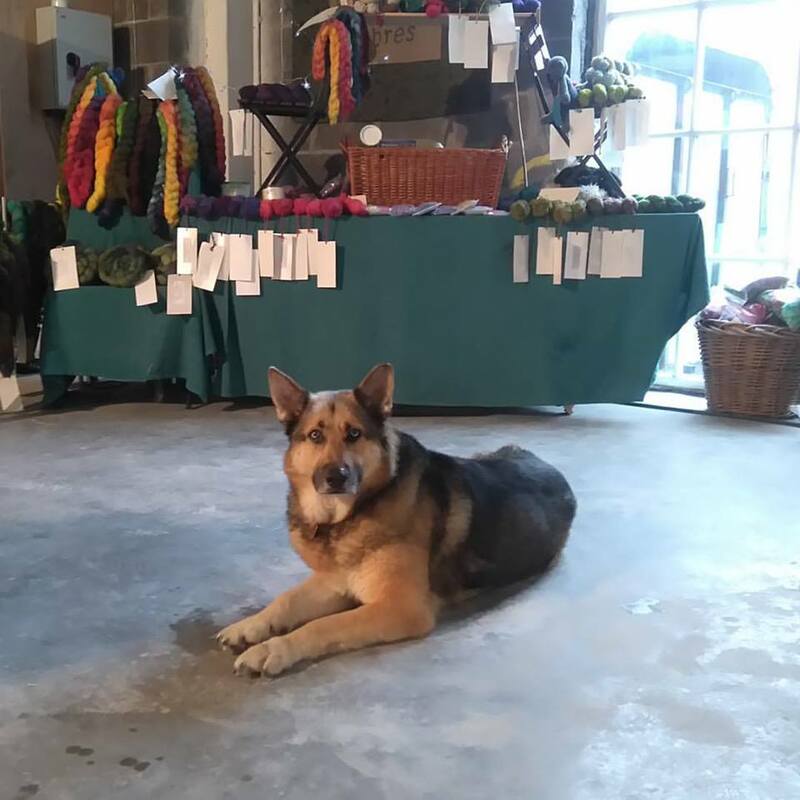 Lunil came with us, and assisted in the setting up. She's really rather good at this sort of thing. 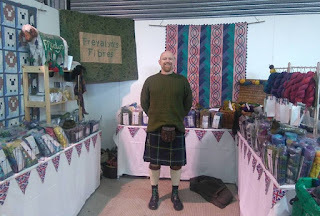 So, that's another fibre-y year over with, and now I can settle down and hibernate for the winter, or could if I only didn't have the day job. 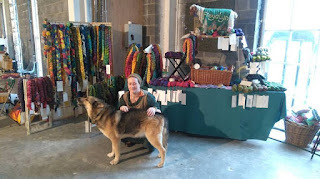 I'm typing this up a week later, enjoying the decadence of a Saturday at home, finishing up a crochet blanket after a scamper through the woods with Lunil in the hope of wearing her out before tonight's fireworks banging. New lamps are being bought at Ikea tomorrow, so I'm not reliant on daylight at weekends to photograph all my dyed fibre. The Etsy shop will be updated soon. Goodness me, lots of things have been happening. But I keep forgetting to take photos, or even ask other people to take photos, and then without images I don't get around to blogging about it. We had a fun day at Wharfe Wool in Ilkley on 7th May; small show, but some nicely picked stallholders. And of course it's only twenty minutes from home. We didn't even have to worry about the dogs, as Mark popped home after we were all set up, and came back for the afternoon. Then there was the Tynedale Spinners' Gathering on 21st May. Long drive for this one, but always worthwhile, catching up with friends and stunning scenery all the way up there. Leeds Wool Festival was at Armley Mills on 4th June. 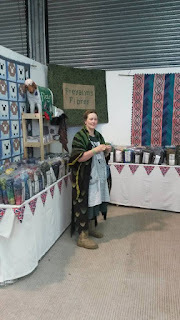 This was just like a garden party with added wool! Fabulous weather, really interesting things to look at as well as the other stalls, an amazing WI cake stall (probably the best bit!) and again, lots of friends to catch up with. We forgot a vital part of the stall - a newly made display board - but luckily this show is near enough home for Mark to whizz back for it and return before opening! 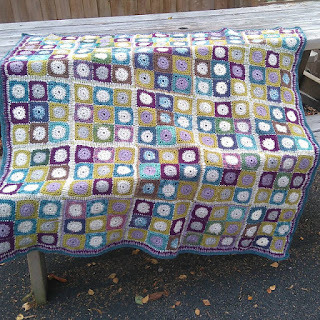 I've moved away from the white table covers (they're now all dyed green/teal), using one of my Welsh blankets, there's a couple of small folding chairs from Ikea to give height, and my fibre is now braided rather than bagged. I thought hard about braiding rather than keeping it in bags, but most fibre eventually felts in bags too, and they don't display the colours and the fibres at their best. Obviously the braids take up much more space than the bags, but I think they look vastly better. They certainly seemed to catch attention at Leeds; let's see what happens at Fibre East. Mark's making me another display screen too. 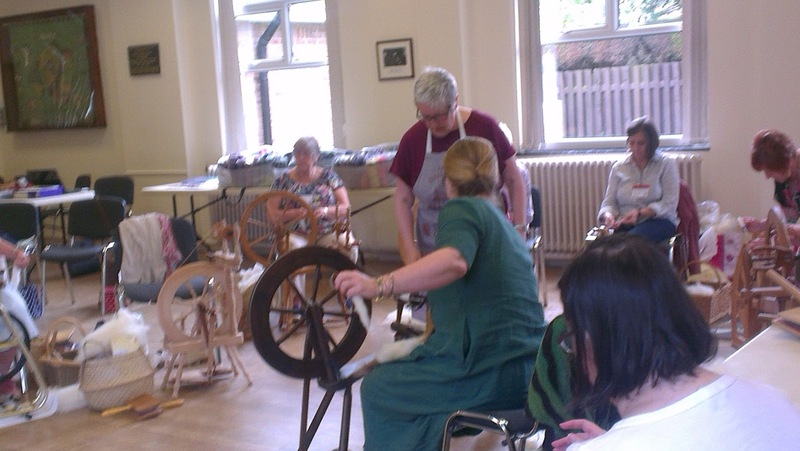 And I had another workshop at the end of May, teaching at North Cheshire Guild. 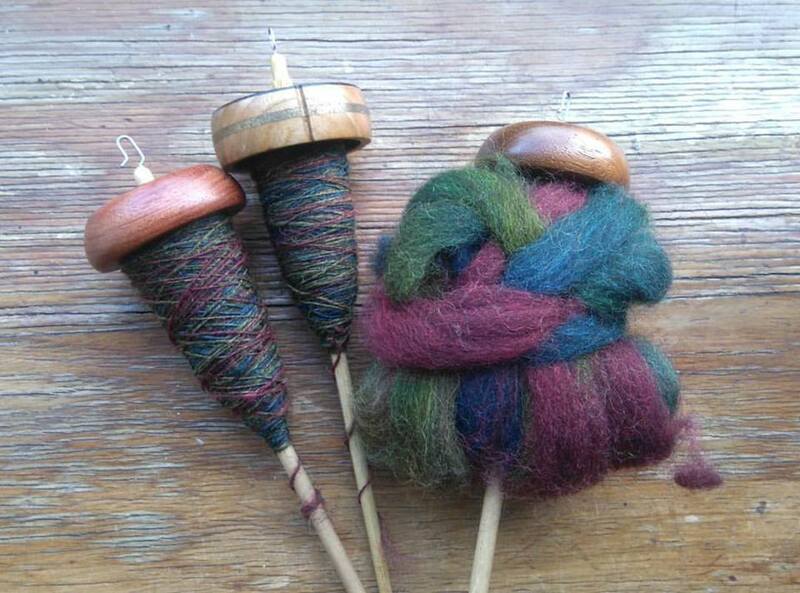 I did a dyeing workshop there a few years ago; this time I was doing my Hand Carding and Long Draw Woollen Spinning workshop. 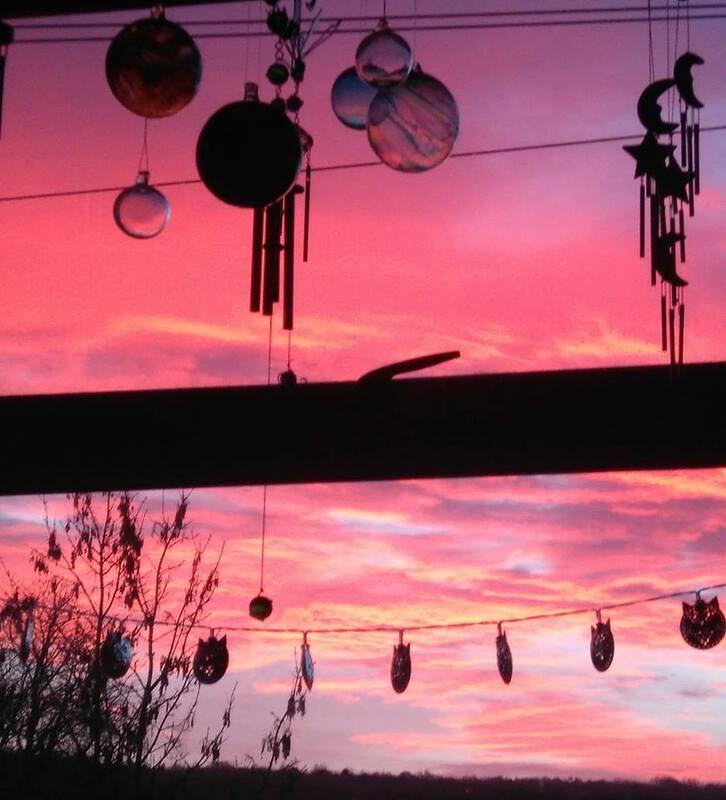 (My oldest workshop, and the most fun to teach). It's also the one that needs least stuff bringing: my wheel, box of hand cards, bobbins and kate, a suitable fleece, and my box of yarn and fabric samples. 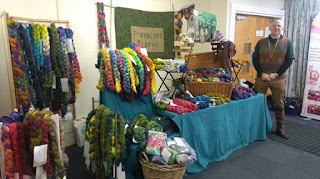 Oh, and various garments to show the type of yarn produced. Someone actually took photographs for me. There were some excellent ones of spinners really getting the hang of long draw, but as I don't have specific permission to post images of them, I'm afraid you can't see them. But the workshop went extremely well. So now I'm in the lull before Fibre East, and a workshop at Peterborough Guild the weekend immediately afterwards (must be crackers!). 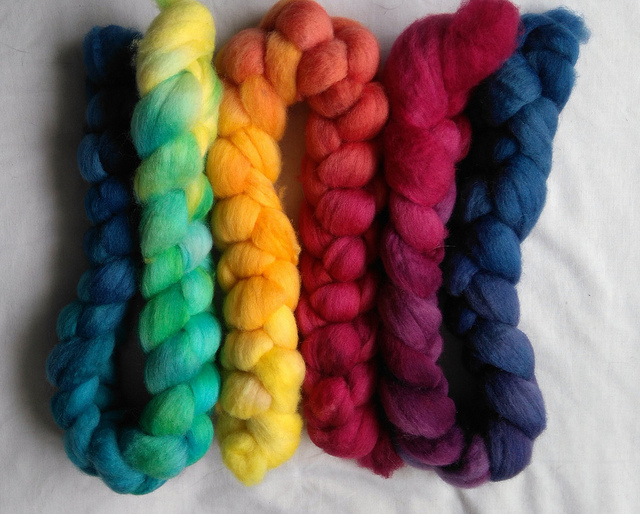 My little bags of scoured and dyed fleece took a tremendous bashing at Leeds, so that's the main thing I'm dyeing up before Fibre East. (That, and sock yarn). Mark and I went up to Wool on the Wall today - not only did we have a good time catching up with people, but I sat and spindled for a while, enthused about spinning to passers-by, helped give advice to a sheepfarmer about his Black Welsh fleeces, but I picked up a longwool cross fleece and a very nice North of England Mule fleece to be dyed and bagged up. And it's Tour de Fleece at the moment. Spinning has been happening (I missed spinning in May and June due to a sudden and enormous knitting commission, which will be written up later) and will be documented when the Tour is over. 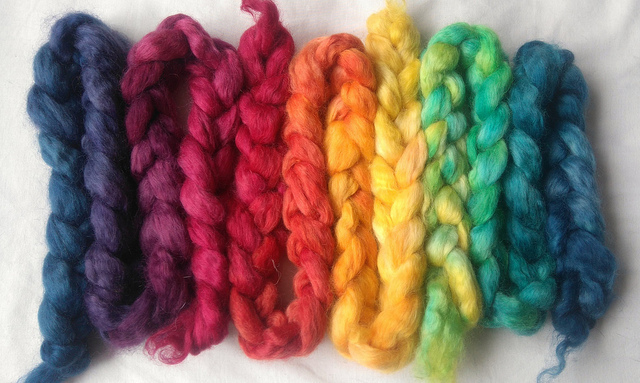 Nicely organised for this weekend's workshop and talk at Lancs & Lakes Guild - the workshop is a dyeing one, and I'm doing a talk on Things Wot I Have Made tomorrow afternoon. And staying with a friend on Saturday night. It's going to be fun. Hard work, but fun. Lambing in Wales - BBC radio's Farming Today. 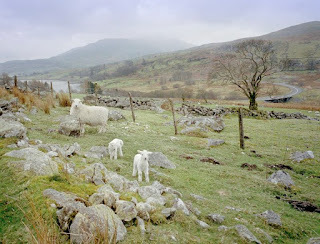 This week's Farming Today programme on BBC Radio 4 has been based in a hill farm in the Brecon Beacons, in the middle of lambing. i wish we could have seen photos of 'The Pen of Cuteness' this morning - all the spare triplets and the odd quads that have been taken off their mothers and put in the same pen to be bottle-fed. All white apart from one little black one in the middle. As the farmer said: "No profit in this corner of the shed, but you've got to give them a chance". There's the last programme in the series on at 5.45 tomorrow morning, but they will all be on the iPlayer for a month.